Silver nano-particles, or nanosilver, are tiny globules of silver about 1/1000th the diameter of a human hair. Since silver is toxic to bacteria, nanosilver is widely used as an antibacterial and is found in over 400 products, including: underwear, socks, towels, carpets, cosmetics, baby bottles, stuffed animals, refrigerators, and washing machines. Because of how common it is, the release of nanosilver into aquatic systems is inevitable and could influence fish and other animals that live in these environments. To study this emerging concern, researchers from Trent University and Lakehead University spent two years adding nanosilver to an entire lake in northwestern Ontario. The study was conducted at the IISD-Experimental Lakes Area, a world-renowned research facility made up of 58 pristine lakes, which are set aside for this type of whole-ecosystem research that simply isn’t possible in most other areas. Researchers then studied each level of the food chain, to determine how nanosilver influenced the lake’s food-web. The main interest of my study was to examine the effects of nanosilver on Yellow Perch and to determine whether their feeding behaviour, growth, and activity changed during nanosilver exposure. Yellow Perch are a popular target for anglers, who prize this fish for it’s delicious taste. Many predatory fish also like to eat Yellow Perch, so they are an important part of lake ecosystems. By catching, measuring and dissecting over 500 fish, and using some mathematical models, I was able to estimate the effects of nanosilver on this species. So far, my initial results suggest there was no significant effect of the nanosilver additions on Yellow Perch. These fish grew and behaved just as well as Yellow Perch from another lake that did not have nanosilver added. Instead, Yellow Perch were more affected by season, with a predictable decrease in body condition (how fat they are) over the winter and spring, and an increase in the summer. This result was unexpected because nanosilver is known to be toxic to bacteria and organisms lower in the food chain. Additionally, the Yellow Perch I studied were found to contain nanosilver, with significant quantities building up in the gills, liver, and muscle tissues over the course of the experiment. But despite accruing nanosilver in their body, we didn’t observe any change in the population size of Yellow Perch, or in the population size of Northern Pike, their main predator. While we found that adding low levels of nanosilver didn’t seem to impact Yellow Perch in my study, it is important to note that the level of nanosilver used was based on 2012 concentrations of the contaminant. Current estimates of the level of nanosilver are much higher than they were in 2012, and we are still adding lots of nanosilver to the environment through wastewater effluent. So, while nanosilver probably isn’t a huge current issue for fish, it is something we should keep an eye on for the future. *This article was written by Lauren Hayhurst, a Graduate Student in the Community Ecology and Energetics Lab at Lakehead University (ceelab.ca). Find Lauren on Twitter @Laur_Danielle. Lake trout like it cold. These beautiful fish are the largest of the char species, and are found in the many lakes of northern Canada and Alaska. Any angler knows that to catch a lake trout in the summer you need to get your lure down to the deep, cold parts of the lake – it’s simply too warm for them to venture close to shore. But during the rest of the year, when the whole lake is colder, these top predators have their run of the place, and often prowl the near-shore zone looking for food. So what is the future for lake trout in a warming world? Researchers from the University of Manitoba and Lakehead University tried to answer this question by studying lake trout behaviour over an 11-year period at the Experimental Lakes Area in Northwestern Ontario. Because the air and water temperature fluctuated over that time period, they were able to explore how lake trout responded to warmer conditions. The researchers used a combination of approaches to study the lake trout. Some fish were tagged with radio transponders, which allowed researchers to track their movement. Other fish were captured multiple times using nets to measure how much they had grown. Additionally, by doing chemical analysis of their scales, the researchers were able to tell what the lake trout had been eating. As predicted, in cooler years lake trout spent more time close to shore. Importantly, this resulted in the consumption of more large prey, resulting in fatter and faster growing lake trout in cold years. This makes sense because many of the fish that lake trout eat live close to shore, and when lake trout are forced offshore (because of high water temperature) they are forced to survive on aquatic invertebrates. If climate change continues to warm the lakes where lake trout live, this coldwater species will need to make a trade-off between the best place for feeding (near to shore) and the cold parts of the lake (offshore). This could result in smaller and skinnier lake trout in the future, and if lakes get too warm, could lead to the loss of lake trout from certain water bodies. Citation: Guzzo et al. 2017 Behavioral responses to annual temperature variation alter the dominant energy pathway, growth, and condition of a cold-water predator. Proceedings of the National Academy of Science. 114:9912-9917. Its happened to everyone. You finally hook up with a fish after hours of flogging the water. Your heart starts racing. And then….SNAP!… you experience a sinking feeling as you realize your line snapped, or the knot you tied with tired eyes at 5 am let go. But while many anglers feel bad about losing a fish, we also feel bad for the fish. The lure we were using is probably still stuck in that fish’s face! And while many humans seem to enjoy facial jewellery, fish have a different sense of style. So what happens to a fish when we break off? How long do they retain the lure, and does it have any negative effects on their health? These are the questions a group of scientists from Canada, USA and Germany tried to answer in a recent paper in Fisheries Research. To perform this study, the researchers brought Northern pike into the lab and simulated the effects of a break off by attaching a lure to the fish’s mouth. Then, these fish were subject to a variety of testing to determine if fish with embedded lures behaved and responded differently to fish without embedded lures. Over the period of 24 hours, 18% of the fish in the study were able to expel their lures, but this only occurred in fish that were hooked shallow (in the outside of the mouth) and did not occur if fish were hooked deeply. For the rest of the fish, having an embedded lure did not seem to have a major influence on their physiology or behaviour. The hooked fish did not have different blood chemistry than fish without embedded lures, nor did they try to dislodge their lures by head shaking or other erratic behaviour. However, the hooked fish did have a higher ‘operculum pumping rate’ than fish without retained lures, suggesting that embedded lures might affect their respiration and make them work harder to recover from exercise. The authors note that their study was relatively ‘short term’ and so it is still possible that break-offs could have a negative long term effect on pike. For example, lure retention might make it harder for fish to feed. As a result, the authors still caution that avoiding break offs (by using proper gear for the species you are targeting, and checking that gear over carefully) is still beneficial for the welfare of fish. And using barbless hooks is probably still helpful to minimize lure retention if you do break off. Regardless of the outcome for fish, we should all aim to land as many fish as we hook, both for our own pride, but also for the fish! How long do anglers air expose fish? In some circles, catch-and-release angling is contentious. Certainly hooking, fighting and air exposing a fish can cause harm and even death, in some circumstances. Most catch-and-release anglers know that air exposure harms fish, and have heard that we should ‘keep ’em wet’. However, most fish that are released are still air exposed for some amount of time, whether during netting and unhooking, or if an angler wants a photo of their catch. While there is good scientific data on how different amounts of air exposure influence the health of fish, we don’t really know how long anglers typically air expose fish. At least that was true until the publication of a recent study by Idaho Department of Fish and Game biologists. The researchers discreetly observed trout anglers on rivers and lakes in Idaho and Oregon, and timed the amount of air exposure of their catches. They found that the average air exposure time was 29.4 seconds, which may or may not be a long time depending on how you look at it. Additionally, 4% of anglers held fish out of water for a period of longer than 60s, with the longest air exposure being 160 s. Previous studies have shown that air exposure for less than 30 seconds probably doesn’t influence the likelihood of mortality for trout, but could have sub-lethal effects than might decrease growth or reproduction. Regardless, air exposure of 29 seconds is certainly longer than required to take a photo, and anglers should aim for no air exposure if possible. Interestingly, the researchers also found that certain factors influenced the amount of air exposure. For example, trout that were netted were air exposed for an average of 10 seconds longer than those landed by hand, and larger fish (> 45 cm in length) were air exposed longer than small or medium sized fish. Additionally, trout that were caught on flies were air exposed less that bait or lure anglers, which could be due to increased difficulty in unhooking fish caught with the latter methods. However these factors did not explain very much of the variation in air exposure times, so it seems that how long fish were air exposed might be more about an individual’s anglers behaviour and choices. The authors argue that the average fight and air exposure times seen in this study probably don’t have negative effects of fish. I won’t dispute that claim, but certainly some individuals are air exposing fish for much longer than is necessary, and harming fish by doing so. We should all aim to decrease handling and air exposure stress in fish we are releasing, so they can grow into the types of fish we will tell our grandkids about. Habitat degradation can have major impacts on fish communities. Changing the environment can shift the balance of power between species, allowing some species to flourish while others suffer. Often a small number of species will exploit the new conditions and become highly abundant while the overall diversity of animals found in a degraded area decreases. Altered habitats can reduce the amount of food, shelter and breeding substrate for certain species causing their populations to decline. There may be other, less obvious routes through which habitat degradation impacts fish. For instance, changes in the environment may have impacts on the cognitive or sensory capabilities of some fish, resulting in a reduced ability to avoid predators or find the resources they need to be successful. McCormick and Lönnstedt (2016) examined how coral reef destruction may impair the ability of certain fish species to learn the identities of new predators and respond correctly to cues of predation risk. Many reef dwelling fish species spend a larval stage floating around the ocean amongst the plankton, before setting down on the reef to spend their adult lives. This transition is a very dangerous time for these fish because they must quickly learn whom among the reef community poses a threat and which animals are benign. Failing to react to a predator can mean certain death, but reacting to non-threatening animals can waste valuable time and energy. Learning all of this information is a challenging task and many of these newly settled reef dwellers do not last long in their new homes. The easiest way to learn if an unfamiliar animal is dangerous is through direct interaction, if a fish chases you trying to eat you and you escape, you now know that species is a threat. However, this is a pretty dangerous way to go about acquiring knowledge, as one false move could spell the end. Luckily, fish of all kinds have evolved an ingenious system for marking unknown stimuli as dangerous using their sense of smell. Fish normally react very strongly to the smell of damaged individuals of their own species. If another member of your species has been injured or killed, chances are something dangerous is nearby and you should take heed. Fish react to these damage induced odours innately, meaning they don’t have to learn this association, they know from birth that the smell of injured members of their own species means that danger is afoot. What fish do learn is the association between these smells and other odours, sights or sounds in the environment. If a fish smells the scent of a conspecific (a member of the same species) that has been injured along with the odour of some unknown species of animal mixed together, they quickly learn that this other unfamiliar smell is probably from something dangerous and should be treated with caution when it is encountered. Using this powerful ability to form associations, fish can learn about possible dangers without having to engage in risky interactions with unfamiliar potential predators. Recent evidence has suggested that coral reef bleaching, caused by increasing ocean temperatures and altered water chemistry may impair the ability for reef dwelling fish to learn about new predators using odour cues. McCormick and Lönnstedt (2016) sought to better understand this effect, determine if it affected different species equally and see if the fish had to be living directly on degraded corals or if dead corals nearby were enough to throw the fish off. McCormick and Lönnstedt captured ambon damselfish (Pomacentrus amboinensis) as they were approaching a reef following their larval stage. The authors then trained the fish by exposing them to a combination of the smell of damaged ambon damselfish and water that had been used to hold a novel predator, the dottyback (Pseudochromis fuscus). After this exposure, the authors placed the ambon damselfish onto one of four types of experimental habitats: a healthy piece of live coral surrounded by live corals, a dead coral surrounded by live corals, live coral surrounded by dead coral and dead coral surrounded by dead coral. The scientists then conducted a test where they gave the fish a shot of water containing either the smell of damaged conspecifics, the smell of dottyback predators or no odours at all and then watched the reactions of the ambon damselfish to each stimulus. What the authors found was that ambon damselfish living in the pristine habitat (on a live coral surrounded by live coral) reacted as one would expect. The plain sea water was ignored while the smell of either the damaged ambon damselfish or the smell of the predatory dottyback was treated with fear: the fish stopped moving, stopped eating and quickly retreated to their shelters. However, if the ambon damselfish was exposed to degraded corals, either directly or in the surrounding habitat, their reaction was very different. Instead of hiding in fear in response to the dangerous stimuli, the fish exposed to dead corals did just the opposite, they moved more, went further from their shelters and increased their foraging rate. These are risky things to do if there is a predator around and suggest that the dead corals are interfering with the ability for the ambon damselfish to respond appropriately to cues of danger, something that may get them eaten and thus potentially have a negative impact on their population. Interestingly, its not that the dead coral merely made it impossible to for the ambon damselfish to smell the predators or damaged conspecifics, because the fish exposed to dead coral still reacted to these odours, but something about the dead corals alters the behaviour in response to these cues, potentially with dangerous consequences. Ambon damselfish are habitat generalists, meaning they will live in a variety of different sorts of places, including both live and degraded reefs. 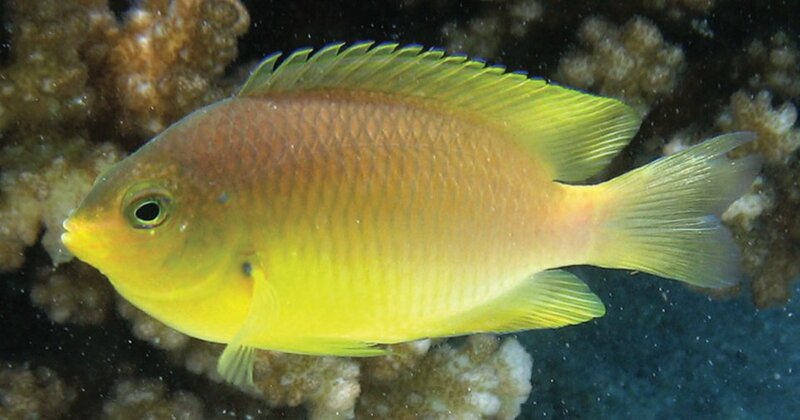 McCormick and Lönnstedt wanted to see if they would find the same sorts of effects of dead coral on the behaviour of another species, the neon damselfish (P. coelestis). Unlike the ambon damselfish, the neon damselfish specialize on living in rubble conditions similar to those found in dead and degraded reefs. When the authors did a similar test on the neon damselfish they found that this species reacted just fine even when living on a dead coral. This suggests that the effects of habitat degradation are species specific and depend on the sorts of habitats the animals normally live on. Together, the results of McCormick and Lönnstedt’s paper suggest that habitat degradation can affect species through less obvious means than just changes in the resources available to them. Changing habitats can also alter the cognitive abilities and behavioural responses of fish, which may have important effects on how well they adapt to changing conditions. Some species may find ways around these impacts and do well even in degraded habitats, while other species do not. It is important for us to consider the effects of climate change and habitat degradation on the cognition and behaviour of different species, and seek to understand why some species may be impacted while others are not. Bait, lures, spinners, spoons, flies, pellets….we spend a lot of time thinking about what to use. But how often do we think about our bait affecting the ecology of a lake or stream? We do try to not dump live bait and to not use certain introduced species as bait as we know this could harm our favourite spots. However, a recent study demonstrated interesting impacts to rivers in the UK from pellets. Pellets (in bait balls) are popular for cyprinid fishing (carp and barbel), and are very high in calories. Anglers often use more than 1 kg of pellets per day in these rivers, so pellets are essentially a superfood that would be regularly available to fish there. Whenever we as humans introduce something new to any ecosystem, we never know exactly how the food web might shift. A new study looked at the diet of the European Barbel (or Common Barbel, Barbus barbus) in four rivers to see how much of its diet was made up of pellets, and if there were any other impacts from having so much extra food around. To do their study, they went fishing (of course) and took 3-5 scales off each Barbel. They also kick-sampled in the rivers for invertebrates and small fish (important parts of the Barbel’s natural diet) and then used stable isotope analysis. Stable isotopes can identify these different prey items, and so the researchers could find out just what the Barbel had been eating for the last few months from just their scales. They showed that the Barbel from the four different rivers ate completely different amounts of pellets. For some Barbel, the pellets made up only 9% of their diet, but in three of the four rivers, the proportion of pellets eaten by an individual Barbel could be in the 70% range, as high as 79% pellets! So, amazingly, some (but not all) Barbel are pretty much avoiding their ‘natural’ diet of invertebrates and small fish to eat delicious pellets instead. This probably shows us why anglers use pellets in the fist place! What are the consequences of this much added ‘food’ in the system introduced by anglers? Well, the authors cite a different paper that showed that the thousands of tonnes of bait ended up changing water chemistry because it added so many nutrients to rivers in Germany. They don’t know what the effects are in these UK rivers, but that would be another even more interesting question that would be nice to see answered in the future. Interestingly, it also shows us how adaptable Barbel can be between different rivers because many end up shifting to pellets for their main food source. Given lots of easy and nutritious extra food (that can’t even get away from them! ), Barbel seriously take advantage of their all-you-can-eat bait buffet. [Editor’s note: This article is the first in a series written by guest authors for this blog. This article was written by Sean Landsman, a PhD candidate at the University of Prince Edward Island. Sean is an incredible photographer and an accomplished angler. Check out his webpage for some amazing fishy photos]. These are two of the most important phases of the lunar cycle for anglers. Talk to just about any accomplished angler and they’ll tell you that catch rates around these moon phases often go up dramatically. But is it a self-fulfilling prophecy? If the fishing community pushes the Kool-Aid for years and years, eventually you’re bound to drink it, right? I’m certainly guilty of leaning heavily on moon phases. I fish my best spots around moon rise/set and plan long-distance fishing trips around the moon phases. Consider, too, the effect of lunar cycles in freshwater. Or rather, is there an effect at all? Certainly large tide swings (i.e., “spring tides”) are consistently associated with the new and full moon periods. So, for saltwater species this may have a huge impact on habitat availability and access to resources (e.g., large tidal flushing moves more food in and out of habitats). However, in freshwater environments such as lakes, ponds, and rivers, there are no tides (Great Lakes aside). So then what is the biological effect? Is it increased light levels at full moons? If so, how would that explain higher catch rates during new moons? Let’s examine a paper published two years ago in 2014 about moon phases and muskie (i.e., muskellunge Esox masquinongy) catch rates. For those not familiar with muskies, they are close relatives of the northern pike, sharing several similar characteristics such as large, well-developed teeth, long bodies built for speed, and a predominantly sit-and-wait foraging tactic. Muskies are native to temperate North American waters, extending south from the Carolinas up to northern Ontario. Two scientists examined the relationship between muskie catch rates and lunar phases by studying almost 240,000 catch records from Muskies, Inc. (a conservation and fishing organization). Catch records from Minnesota, Wisconsin, Canada, and Ohio were examined. Each date a fish was caught was then related to a specific lunar phase. The authors also compiled angler effort data to address whether catch rates could be biased because anglers focus their efforts during the full and new moon periods. After a series of complex statistical analyses, their results did indeed indicate that lunar phase has a significant impact on angler catch rates. Specifically, new and full moon periods were the best predictors (of all possible lunar phase combinations) of an angler catching a muskie. And bigger fish were also caught during these full and new moon periods. As a default explanation for these findings, the authors’ hypothesis was that angler effort is simply more concentrated during these time periods. The authors acknowledge that this is something that cannot be ignored. However, their findings showed that lunar phase only significantly affected angling effort for one specific lake in Minnesota. What their data point to is some sort of synchronicity occurring between muskies and the lunar cycle. The authors also noted that catch rates were similar between new and full moon periods. If this were not true (for example, if catch rates were greater during full moon periods only), then one might correctly posit that full moons lead to increased light levels and increased muskie foraging. However, the authors’ results do not support this. So what the heck is going on then? The answer is really that we still do not understand the underlying mechanism. The authors suggest that synchronizing feeding behaviour with the lunar cycle must confer some advantage to individuals. The author with a 48 inch muskie captured almost to the minute of a rising full moon (just out of frame). So what does this mean for us anglers? This study certainly lends quite a bit of credence to focusing efforts around the new and full moon periods, at least for muskies. Many of us cannot afford to fish whenever we want to so maximizing our time on the water becomes important. If you feel guilty about “drinking the Kool-Aid,” as I sometimes do, I think this study should allay that guilt. To end on a personal note, I still have a hard time understanding how moon phases affect muskie behaviour. Without a clear explanation, I will continue to be skeptical. What do you think? Do you plan your fishing trips around the new and full moon periods? Do you have any hypotheses that would explain increased catch rates – muskies or otherwise – during these moon phases? Feel free to add your thoughts in the comments. Citation: Vinson MR, Angradi TR. 2014. Muskie Lunacy: Does the Lunar Cycle Influence Angler Catch of Muskellunge (Esox masquinongy)? PLoS ONE 9(5): e98046. There’s no doubt that fishing causes changes to fish populations, which is why anglers dream of travelling to remote locations where few people have fished before. In some fisheries, larger individuals are selectively removed, which can result in a decrease in growth rate of individuals over time (since those who grow fastest get big, and then get caught). In other fisheries, aggressive and bold individuals may be more likely to be captured, resulting in the evolution of a more passive, shy population over time. These changes are referred to as ‘angling induced evolution’, and can have a very strong influence on fish behaviour. However, two recent papers have suggested that different methods of fishing can select against individuals with different traits, and could cause different evolutionary outcomes for fish populations. In one of those studies, Dr. Alex Wilson and colleagues from Carleton University tested whether fish caught with hard-bodied ‘crank-bait’ type lures were behaviourally different than fish caught with soft plastic worms. First, they angled wild rock bass and large mouth bass using the different lures, and then brought the fish back to the lab for behavioral testing. They found that fish caught with crank-baits were generally bolder than fish caught with plastic worms, suggesting that the evolutionary consequences of angling might be dependent on the type of lure used! Additional evidence that different fishing methods capture individuals with different behaviour came from a study by researchers at the University of Bergen (in Norway). The Norwegian team tested whether individuals captured by trawl fishing were behaviourally different than those captured with a passive minnow trap. They performed their study in the lab on guppies, using miniaturized trawls and traps to simulate a larger fishery. What they found was that bolder individuals were more likely to be caught by the trap than shy individuals, but were less likely to be caught by the trawl. The exact same individuals that were more likely to be caught by one method, were less likely to be caught by the other! Taken together, the results provide some pretty strong evidence that different types of fishing capture fish with different personalities. As a result, it could be beneficial to have a diverse mix of angling activity (e.g. fly fishing, bait fishing, traps) in order to maintain behavioural diversity in a population. Furthermore, the results of these studies suggest that in areas with high fishing pressure it might be a good idea to try an unconventional tactic – if you do, you might just have evolution on your side! B Diaz Pauli et al. 2015. Opposite selection on behavioural types by active and passive fishing gears in a a simulated guppy Poecilia reticulata fishery. Journal of Fish Biology 86:1030-1045. Is climate change driving Arctic char upriver? Arctic char are a pretty incredible animal. They are the most northern freshwater fish on earth, can live for over 20 years, have incredible coloration, can grow to over 30 pounds and are voracious cannibals. Arctic char are the trout of the north, and they thrive in frigid, dark habitats. In most of their range, Arctic char are classified as semi-anadromous. Many adult fish migrate out into the ocean in the spring and return to freshwater in the fall, where they spawn and overwinter in lakes. However some individuals stay put in freshwater year round, and in some cases entire populations stay permanently in freshwater. In a study in the journal Global Change Biology, researchers from Norway and Sweden investigated how Arctic char migrations might change with a warming climate in the north. Many bird populations are showing altered migratory timing in response to climate change, but would there be similar effects on fish? First the researchers needed to determine what factors influenced migratory behaviour in Arctic char. Why did some some populations migrate out to the ocean while others stayed put in freshwater? They found out that migration was more common in areas with low primary productivity, and in areas with shorter migration distances to the sea. So if there was lots of food around, and the sea was hard to reach, char might be convinced to stay in freshwater throughout the year. Next, the researchers used climate models to predict the change in productivity of lakes along the coast of Norway, and how this might influence the range of Arctic char. Various climate models predicted that primary production in lakes will increase with climate change, and as a result there will be more food available for char in freshwater. This led the researchers to predict that there will be less anadromous populations, and more freshwater populations of Arctic char in the future. Ultimately, this will decrease the range of Arctic char, since less fish will migrate out to the ocean. The researchers don’t speculate on whether this will influence overall population size of Arctic char, but there might be fewer spots to fish for them in the future. Citation: AG Finstad and CL Hein. 2012. Migrate or stay: terrestrial primary productivity and climate drive anadromy in Arctic char. Global Change Research 18, 2487-2497.